Some nights just scream for pizza. Even when you’re trying to eat “right” and avoid processed food, sometimes it’s just pizza time! One afternoon last week, this wasn’t a last minute decision, I started working on my own cast iron skillet pizza, to see if it would pass muster with the the family. Of course I used Einkorn wheat flour for my crust, which I’m sure you’re sick of hearing if you are a regular reader of my blog. But what’s the point of making your own pizza if you are going to use the same nasty ingredients as you can order up from a delivery service? Ok, that’s not fair, I’m sure most delivery services still use much nastier ingredients than I could find in my grocery store if I tried, which I wouldn’t. 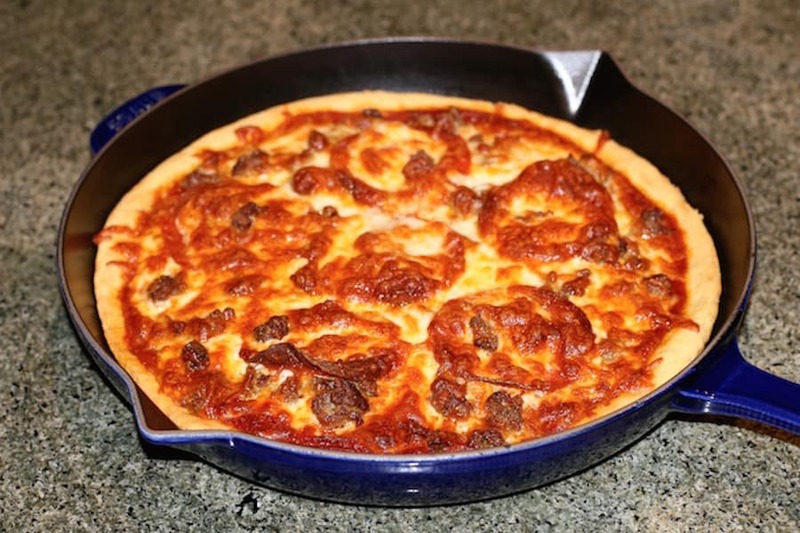 During one of my many online searches for recipes and food related searches, I stumbled across an article about making pizza in a cast iron pan. 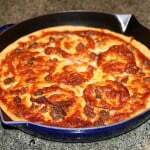 I have a cast iron pan, why don’t I give that a try? 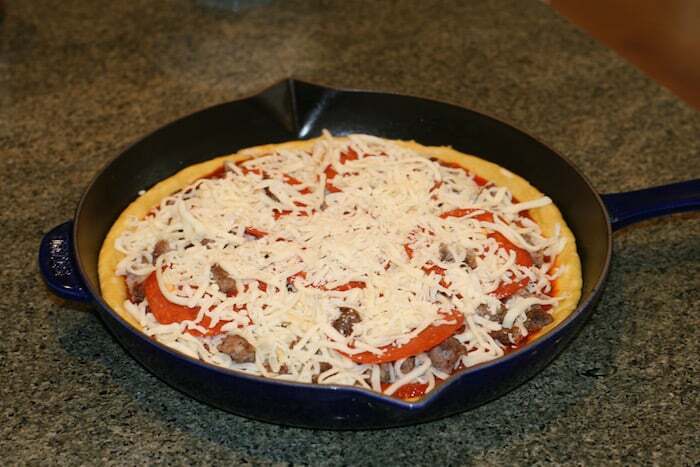 In the past, when making pizza at home, I’ve gone with the pizza stone in the oven, and slipped the pizza on to the stone using parchment paper. But this time out, it looked like I was going to find another use for my enamel cast iron skillet. I was a bit shocked at how quickly and easily this pizza came together. The hardest part is to remind yourself to start early enough in the day to get your Einkorn wheat flour pizza dough going. Just in case you are new to my blog, I almost always use Einkorn Flour when baking to avoid many of the harmful consequences associated with modern dwarf wheat. I spent about 10-15 minutes getting the dough together at 2:00 in the afternoon the same day I was planning on eating the pizza. Maybe on my next attempt, I’ll get started earlier, but it still worked, so really, I shouldn’t complain. Once I had the dough combined, I let it sit in my microwave, with a cup of hot water next to it, for an hour. After that, into the fridge until an hour before I wanted to eat. After I took my Einkorn flour pizza dough back out of the fridge, I let it sit on the counter for 30 minutes. After that, using my hands, I spread the dough into the bottom of my cast iron skillet, which I had oiled just a little bit with a tablespoon of olive oil. 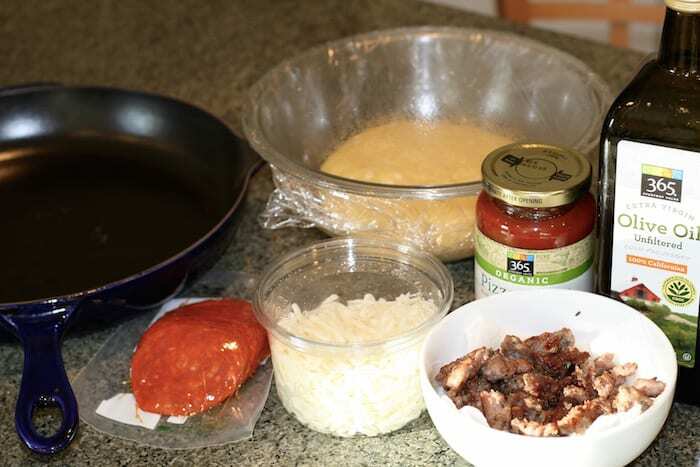 One the dough is spread out in the bottom of the pan, it’s as simple as layering on whatever ingredients you want on your pizza. 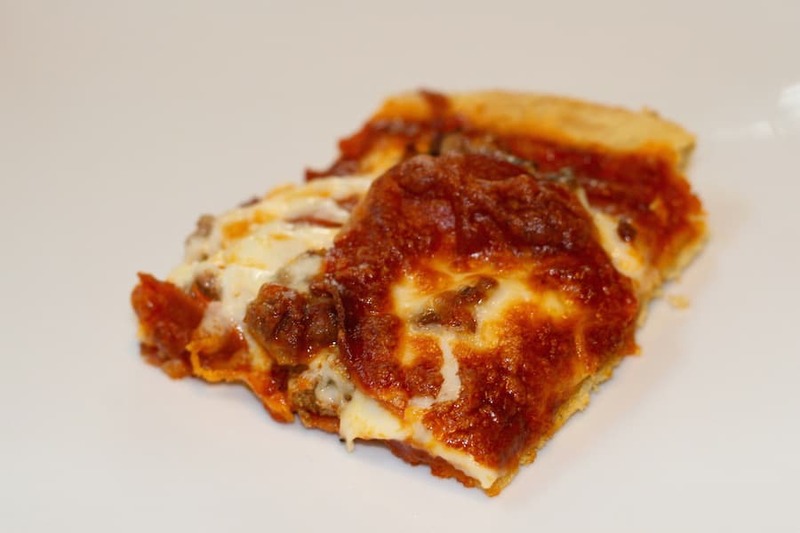 We tend towards a meat lovers pizza of some sort almost any chance we get, and this was no exception. We used some pepperoni made from pastured pork and also used some Italian sausage from a local pork vendor, so I felt pretty good about the quality of the meats we chose. But before the meat went on, we placed a pretty healthy layer of tomato sauce down. I forgot to season the tomato sauce this time, I guess I was too excited, but I normally sprinkle some dried herbs on top just to add a little bit more depth and flavor. Fun fact about jarred or canned tomato sauce, it’s actually more nutritious than fresh, because super ripe tomatoes are used for canning, and the heat of the canning process actually increases the levels of lycopene, which I’ve read is helpful in fighting prostate cancer and other illnesses. And then the cheese. It seems that there shouldn’t be much to think about with the cheese, but get this decision wrong, and it can ruin the entire process. We’re pretty traditional here, so mozzarella is just fine for us, but don’t even think about cheese made from skim milk! If I can’t find mozzarella made from whole milk, with some fat included, then I’m just not sure it’s the right night for pizza. Seriously. No skim milk, just say no. So I started at 2:00 pm, had my cast iron skillet pizza with Einkorn wheat flour crust in the oven by 6:00, and on the table ready to eat before 6:30, not too bad! in a large bowl or using a standing mixer, combine all of the ingredients for the dough together and knead for a few minutes until smooth and elastic. I love this recipe!! I make it all the time but I always skip the refrigerator part due to time. I never remember to get going early. How long is supposed to be in there? Can it just go from the 1 hour rise to baking part? Anyway, that’s the way I do it but not sure if I’m missing a vital step. Thanks for this awesome recipe!! I’m an einkhorn and cast iron fan so this is perfect! That is perfectly fine! I would skip the fridge too if I prepared the dough right before needing it, I only use refrigerator if I get the dough going early in the day to develop flavor and need to slow down the rising, but it will work just fine without that step! What size is your cast-iron skillet? 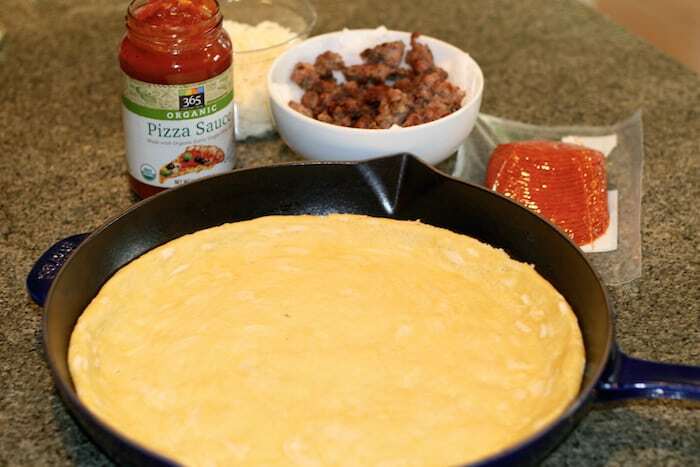 I’m pretty sure that the one I used in those photos is a 12″ skillet, but I’m sure all sorts of different sizes would work fine, just adjust the amount of dough you use, and maybe the cooking times a little.